Typical Fittings: Custom fabricated, weld-on permanent ends. All ends are installed and tested by certified welders to section IX of the ASME boiler and pressure vessel code. All lengths are commonly measured by overall length (OAL) and ends are available in carbon steel, 304 stainless, 316 stainless, or monel. Contact us for minimum live length tables required for offset motions and applications subject to vibration. Detail Comments: Working pressure is dependent upon the temperature of the application, the fitting style, and the number of braids (contact us for manufacturer derating/correction factors as the temperature goes up). 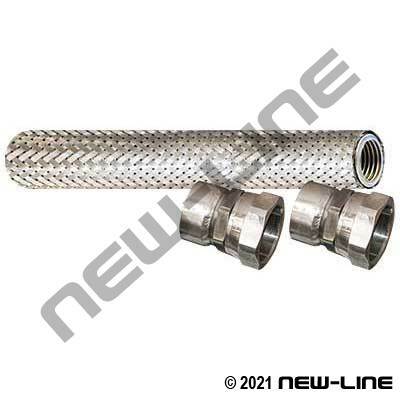 For "double" braided hose, the working pressure can be multiplied by x1.5 (as a GUIDE ONLY), the part # is SD321.